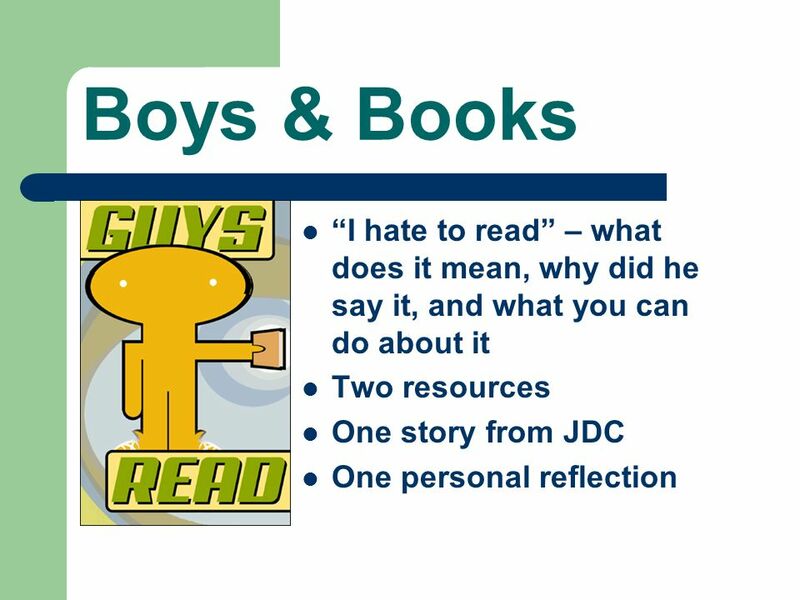 Boys & Books “I hate to read” – what does it mean, why did he say it, and what you can do about it Two resources One story from JDC One personal reflection. 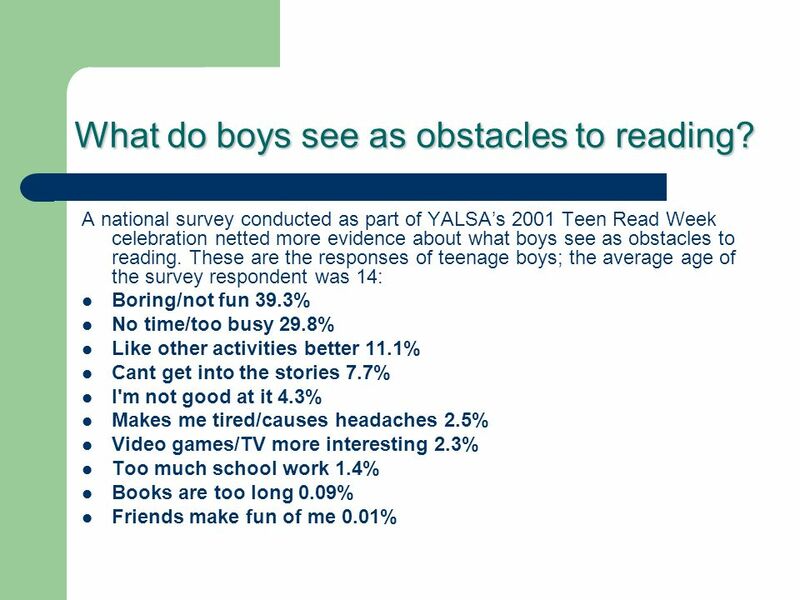 3 What do boys see as obstacles to reading? 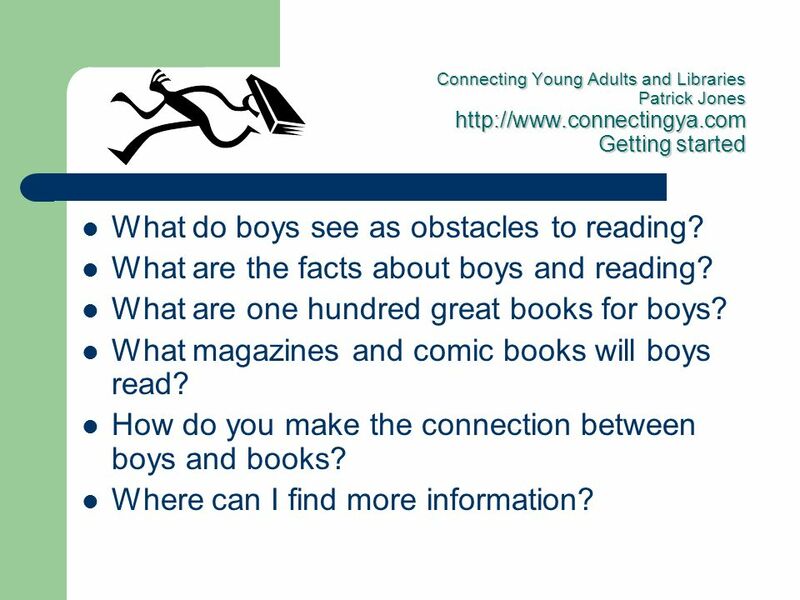 Connecting Young Adults and Libraries Patrick Jones Getting started What do boys see as obstacles to reading? 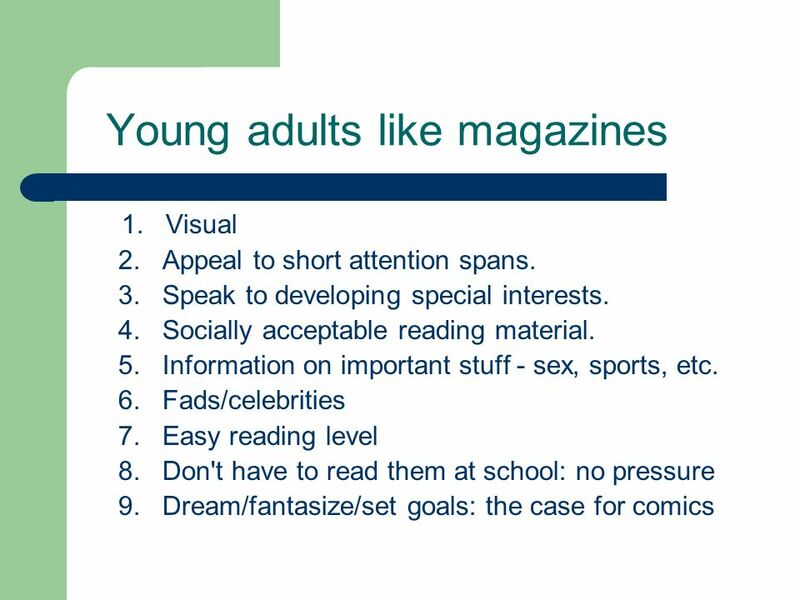 What are the facts about boys and reading? 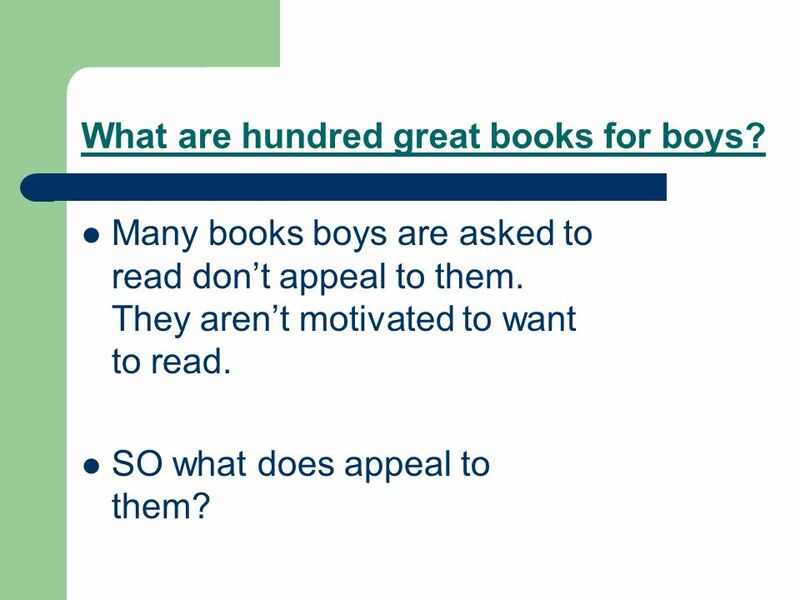 What are one hundred great books for boys? 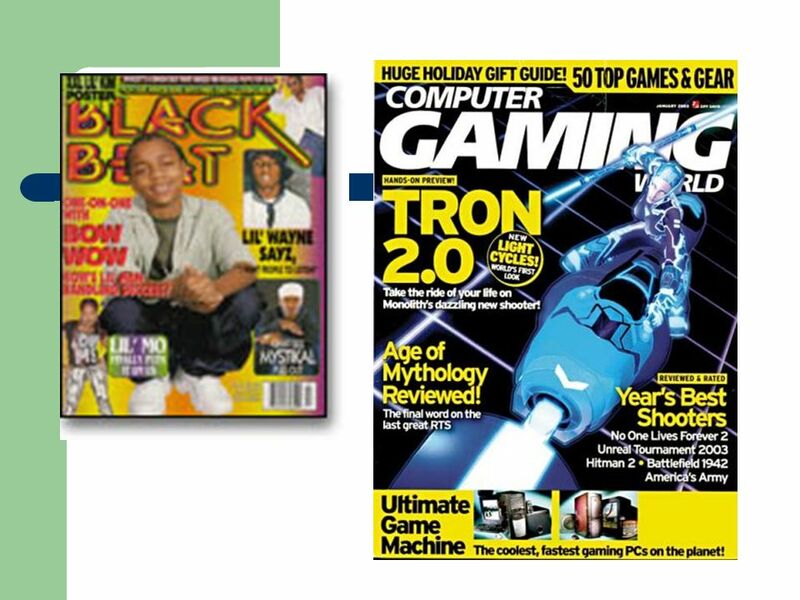 What magazines and comic books will boys read? How do you make the connection between boys and books? Where can I find more information? 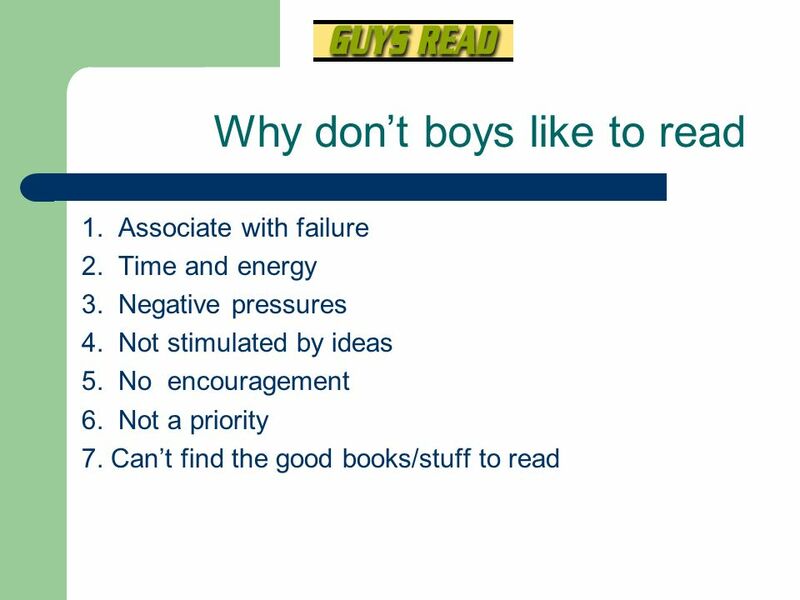 4 What do boys see as obstacles to reading? 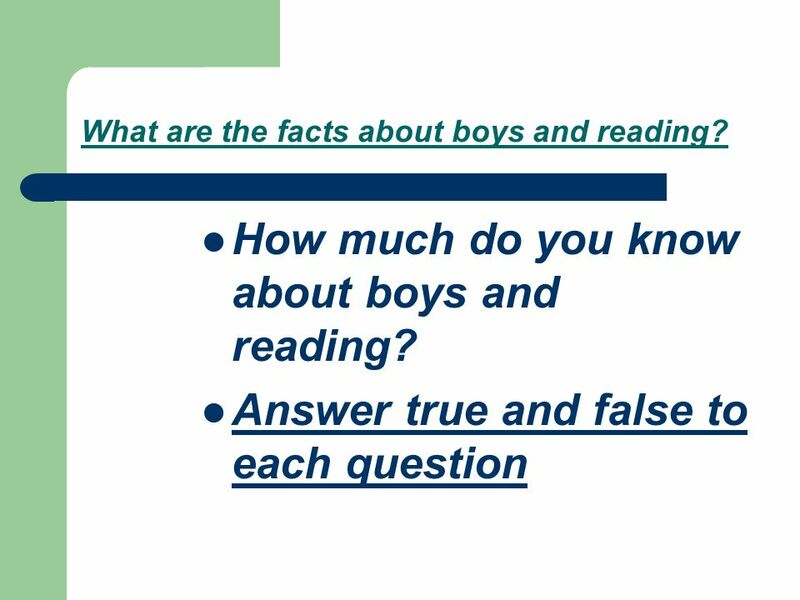 5 What are the facts about boys and reading? 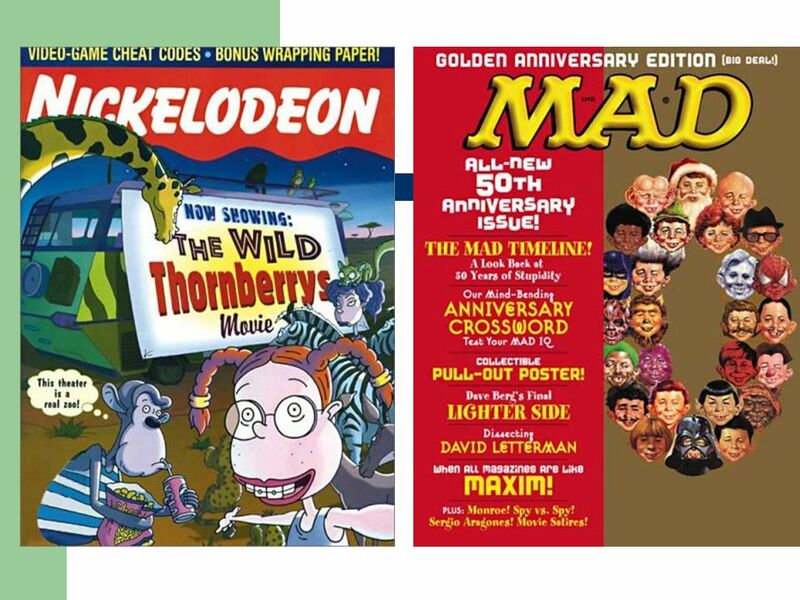 6 What are hundred great books for boys? Many books boys are asked to read don’t appeal to them. They aren’t motivated to want to read. SO what does appeal to them? 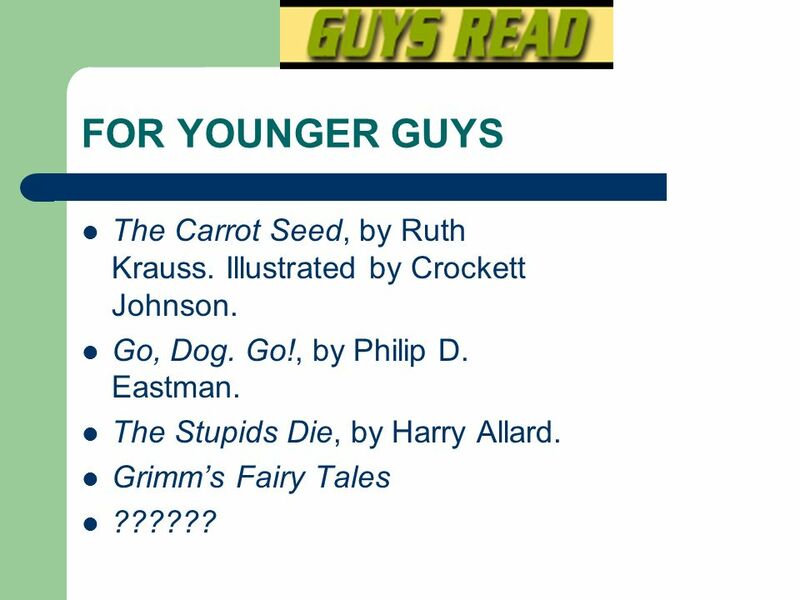 8 FOR YOUNGER GUYS The Carrot Seed, by Ruth Krauss. Illustrated by Crockett Johnson. Go, Dog. Go!, by Philip D. Eastman. The Stupids Die, by Harry Allard. Grimm’s Fairy Tales ?????? 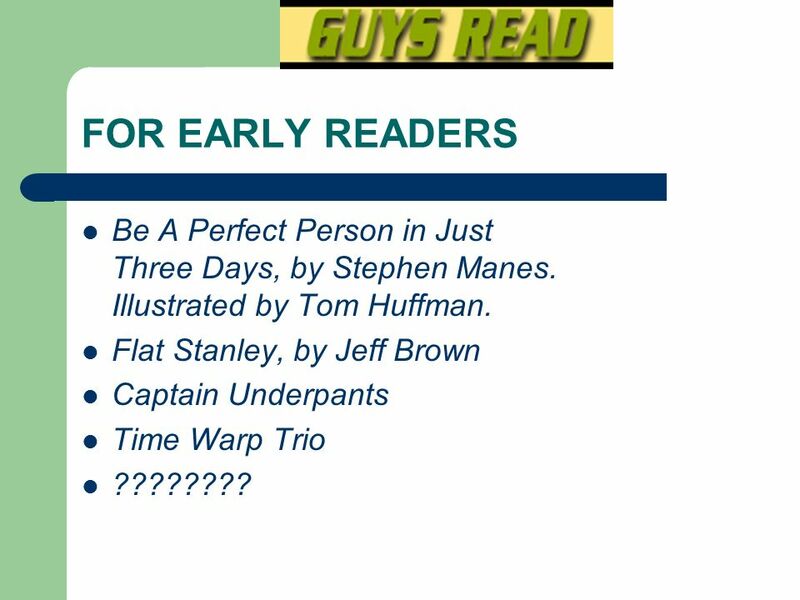 9 FOR EARLY READERS Be A Perfect Person in Just Three Days, by Stephen Manes. Illustrated by Tom Huffman. Flat Stanley, by Jeff Brown Captain Underpants Time Warp Trio ???????? 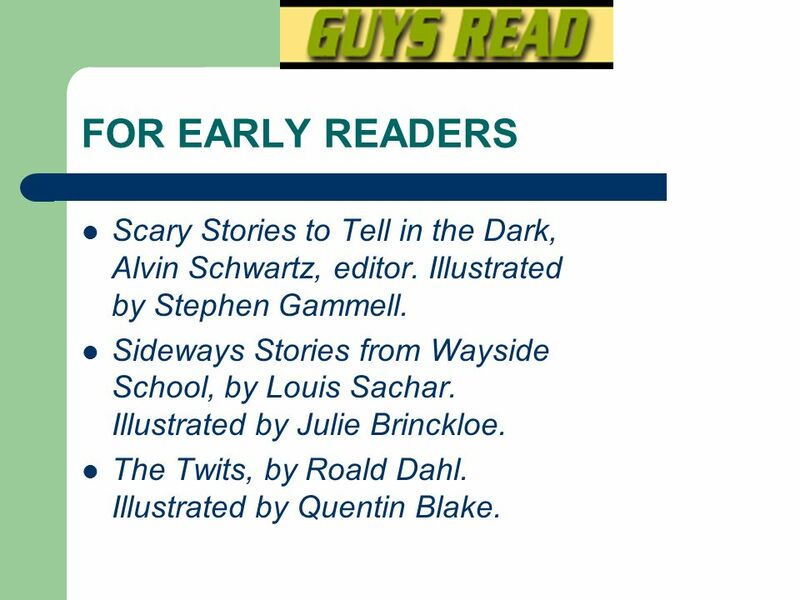 10 FOR EARLY READERS Scary Stories to Tell in the Dark, Alvin Schwartz, editor. Illustrated by Stephen Gammell. Sideways Stories from Wayside School, by Louis Sachar. Illustrated by Julie Brinckloe. The Twits, by Roald Dahl. Illustrated by Quentin Blake. 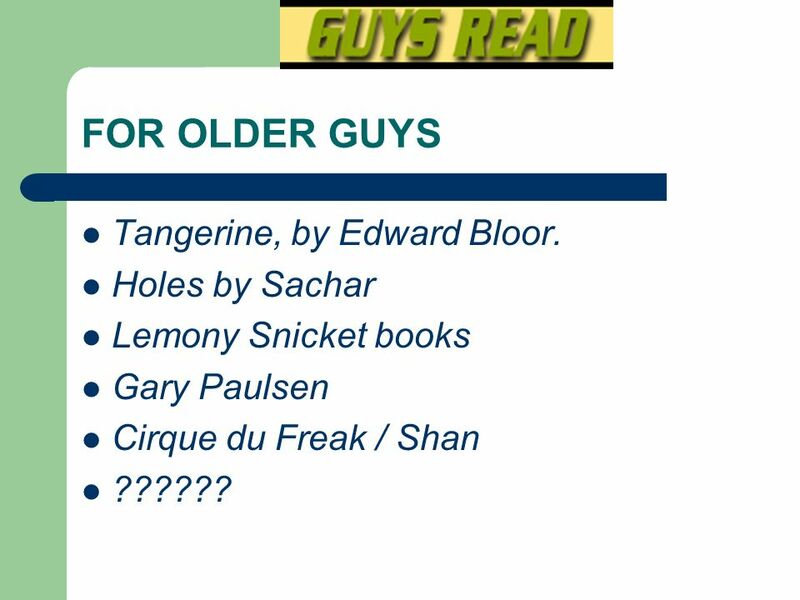 Lemony Snicket books Gary Paulsen Cirque du Freak / Shan ?????? 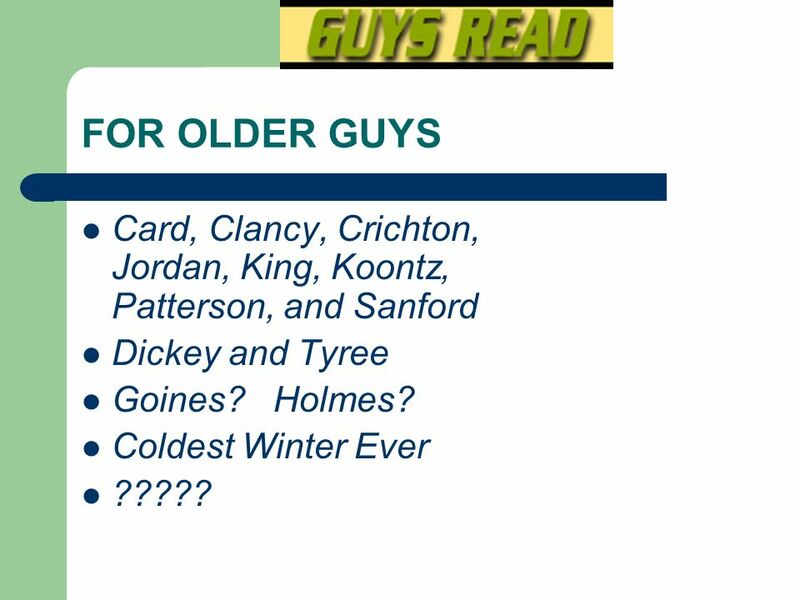 12 FOR OLDER GUYS Card, Clancy, Crichton, Jordan, King, Koontz, Patterson, and Sanford Dickey and Tyree Goines? Holmes? Coldest Winter Ever ????? 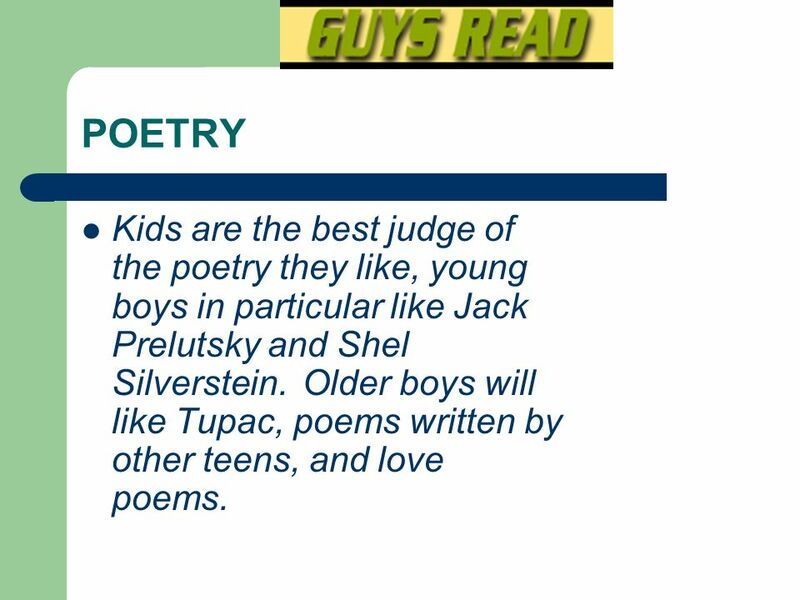 13 POETRY Kids are the best judge of the poetry they like, young boys in particular like Jack Prelutsky and Shel Silverstein. 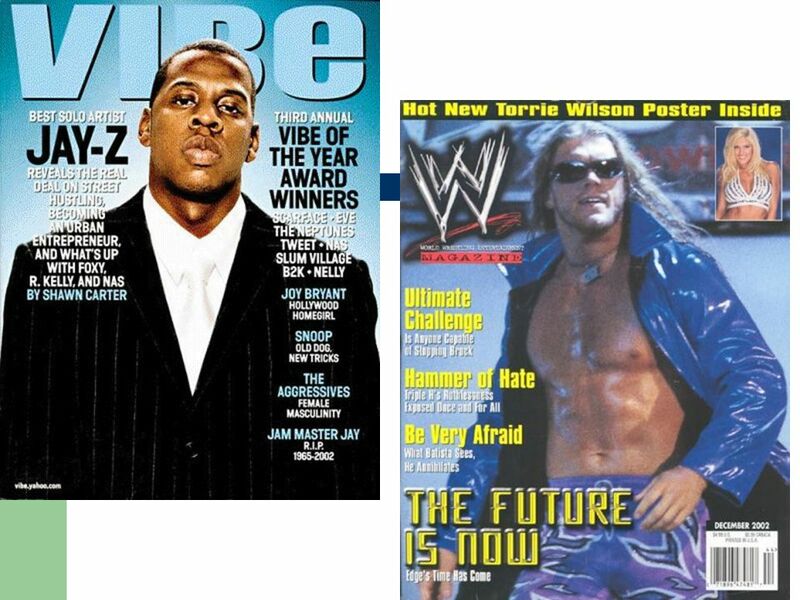 Older boys will like Tupac, poems written by other teens, and love poems. 14 NON-FICTION Choose books based on the subjects they care about. 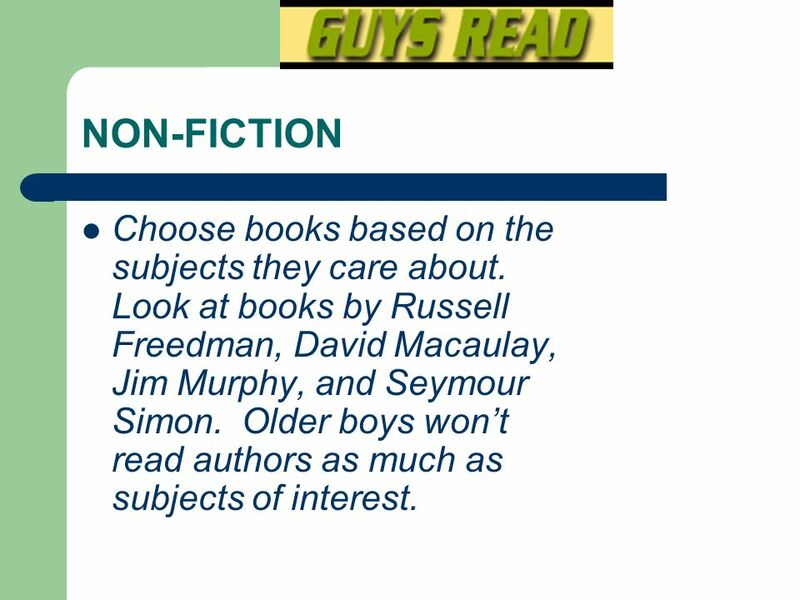 Look at books by Russell Freedman, David Macaulay, Jim Murphy, and Seymour Simon. 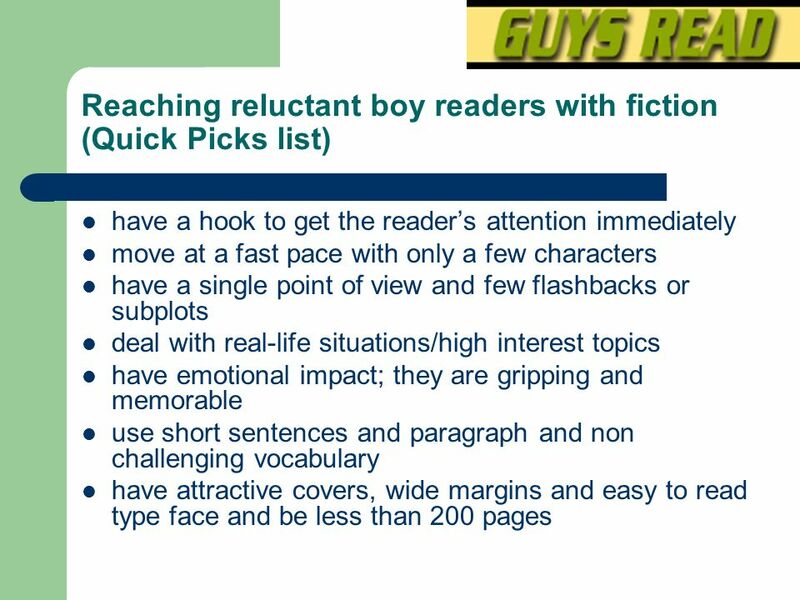 Older boys won’t read authors as much as subjects of interest. 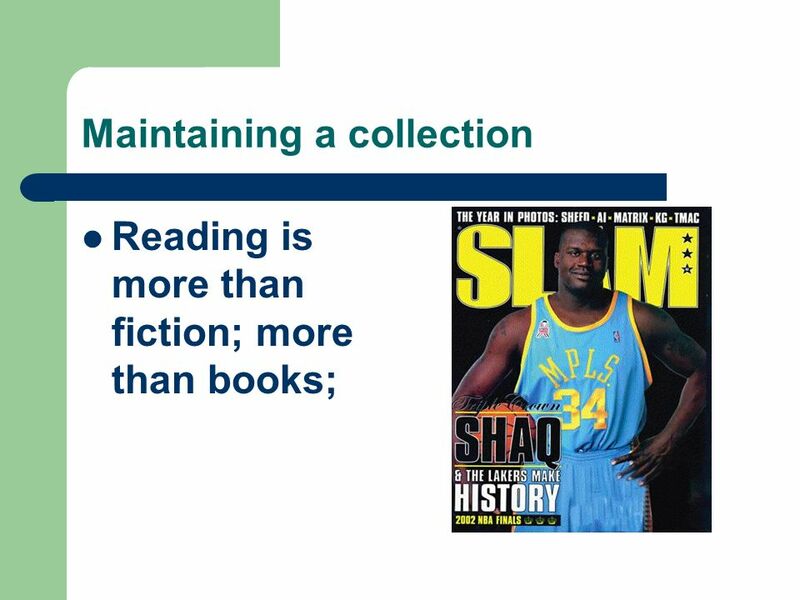 Researching reading and at-risk teens is a focus of Dr. Teri S. Lesesne from Sam Houston State University. 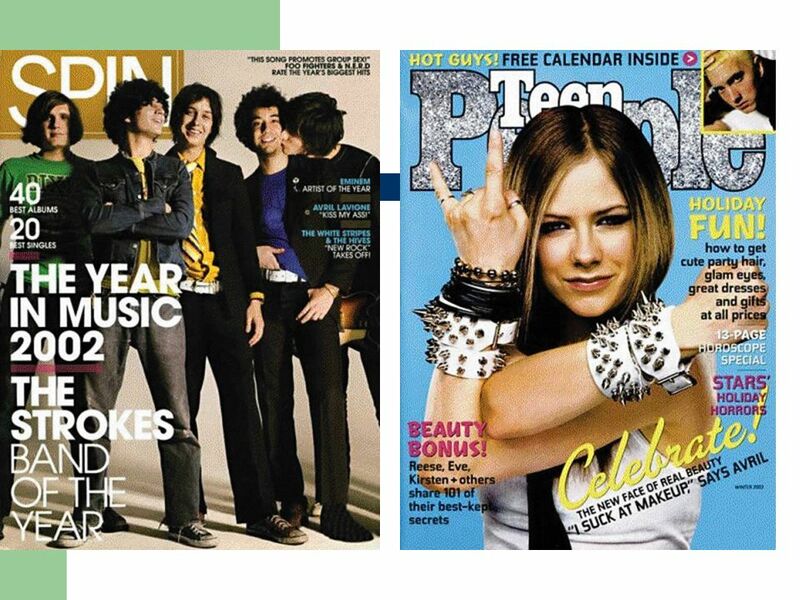 She says, “In my seven year study of at-risk teens, one of the observations I have been able to verify year after year is that nonfiction matters to these less than enthusiastic readers. 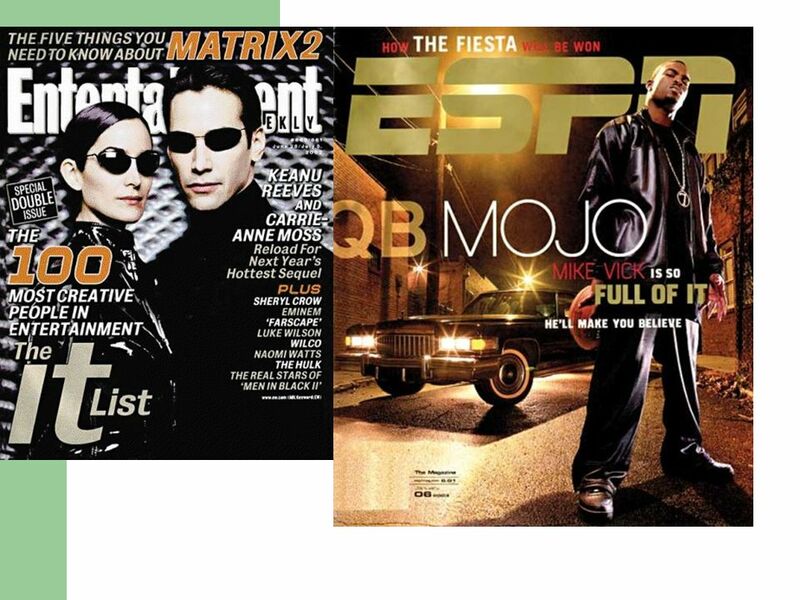 Even though some of them read nonfiction regularly, they do not see themselves as readers because nonfiction is not as valued in the English classroom.” . 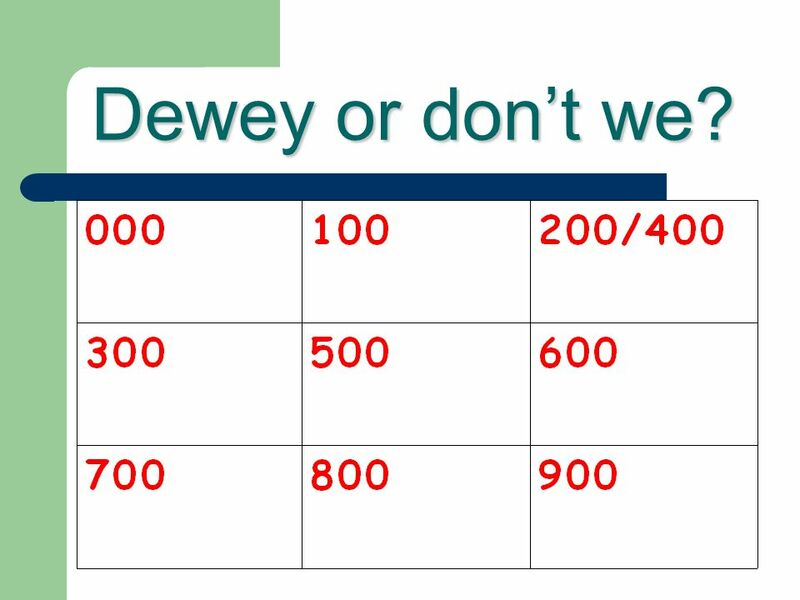 28 Dewey or don’t we know ? 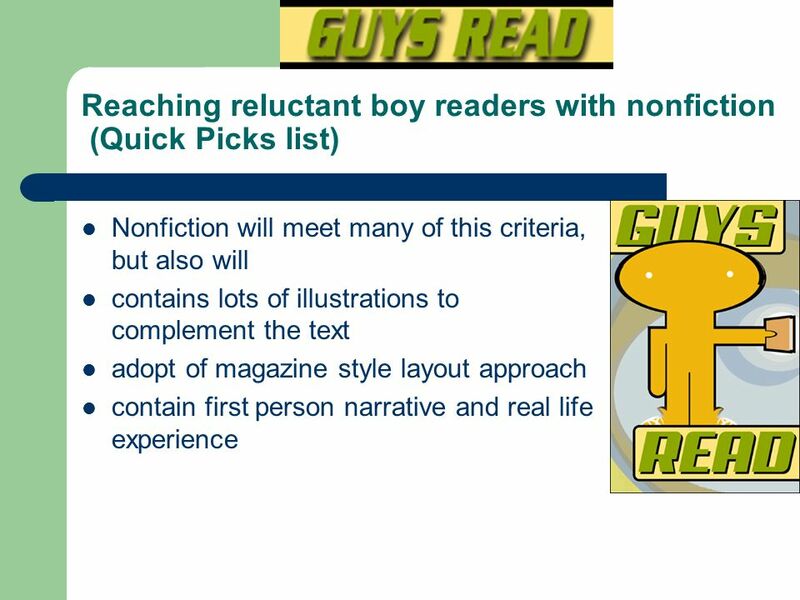 What are the nonfiction areas, by Dewey number, which are popular with boys? 29 Dewey or don’t we? 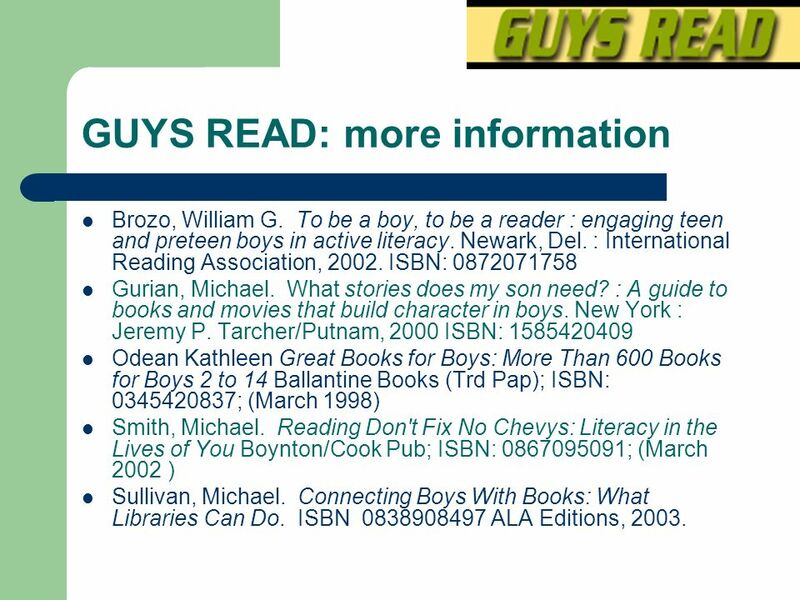 Brozo, William G. To be a boy, to be a reader : engaging teen and preteen boys in active literacy. Newark, Del. : International Reading Association, ISBN: Gurian, Michael. What stories does my son need? 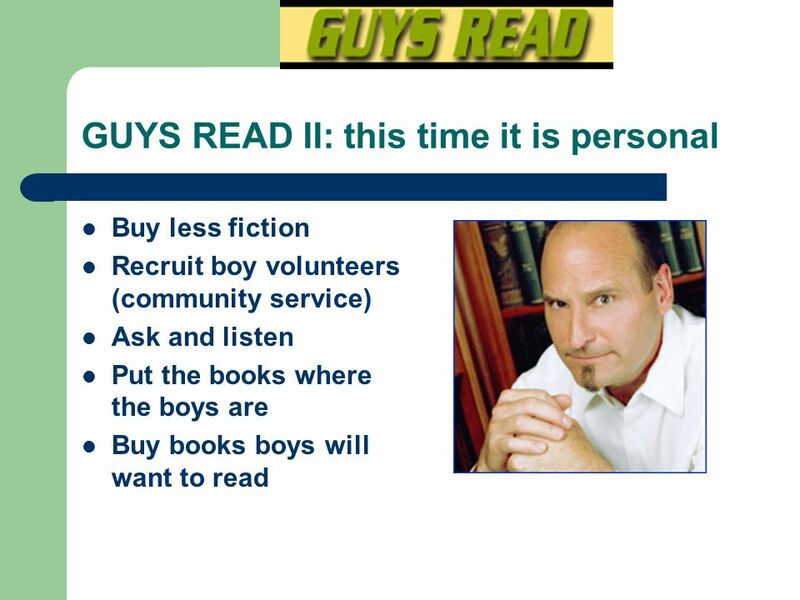 : A guide to books and movies that build character in boys. New York : Jeremy P. Tarcher/Putnam, 2000 ISBN: Odean Kathleen Great Books for Boys: More Than 600 Books for Boys 2 to 14 Ballantine Books (Trd Pap); ISBN: ; (March 1998) Smith, Michael. 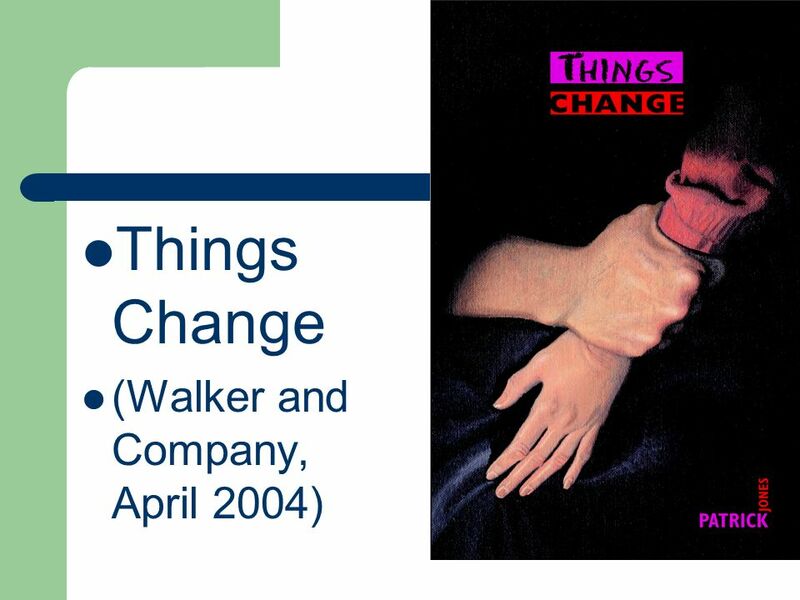 Reading Don't Fix No Chevys: Literacy in the Lives of You Boynton/Cook Pub; ISBN: ; (March 2002 ) Sullivan, Michael. 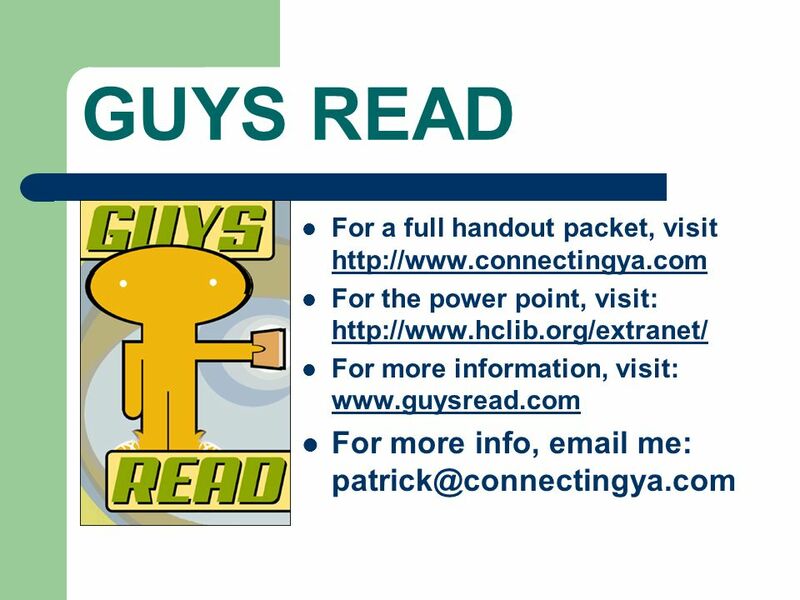 Connecting Boys With Books: What Libraries Can Do. 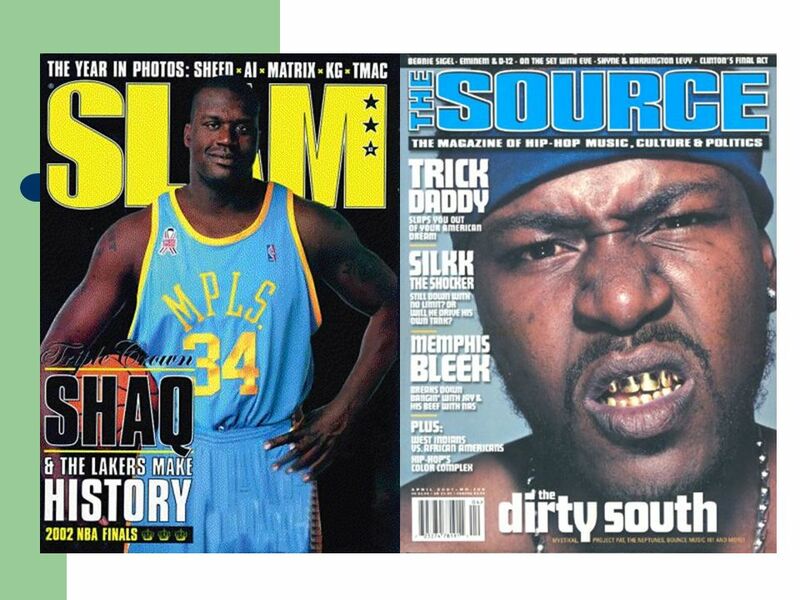 ISBN ALA Editions, 2003. 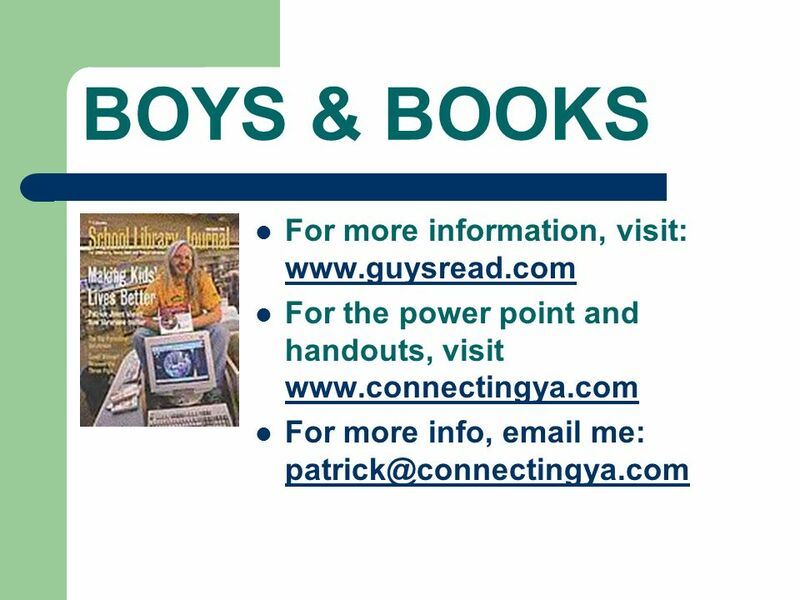 Download ppt "Boys & Books “I hate to read” – what does it mean, why did he say it, and what you can do about it Two resources One story from JDC One personal reflection." 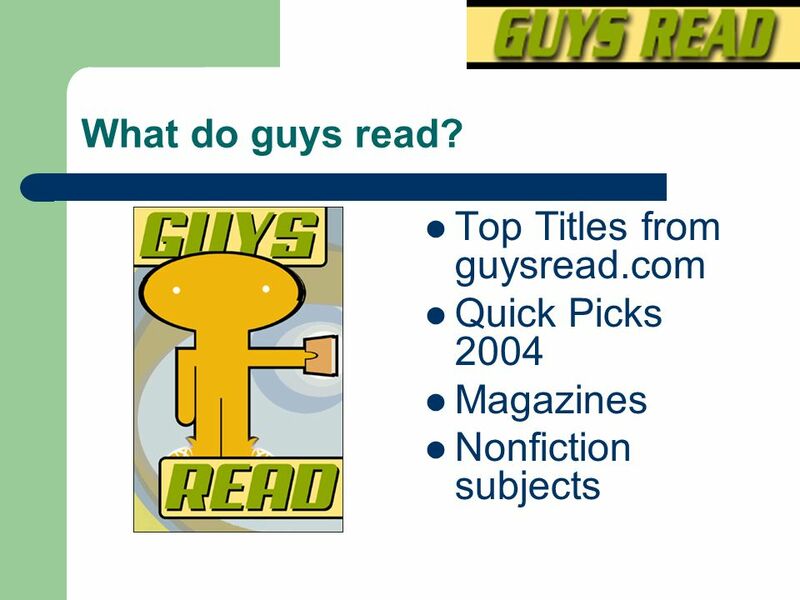 October 2002 ALSC 2002 National Institute / Guys Read / Power Point by Patrick Jones, Hennepin County Library Reading Don’t Fix No Chevy A quick review. 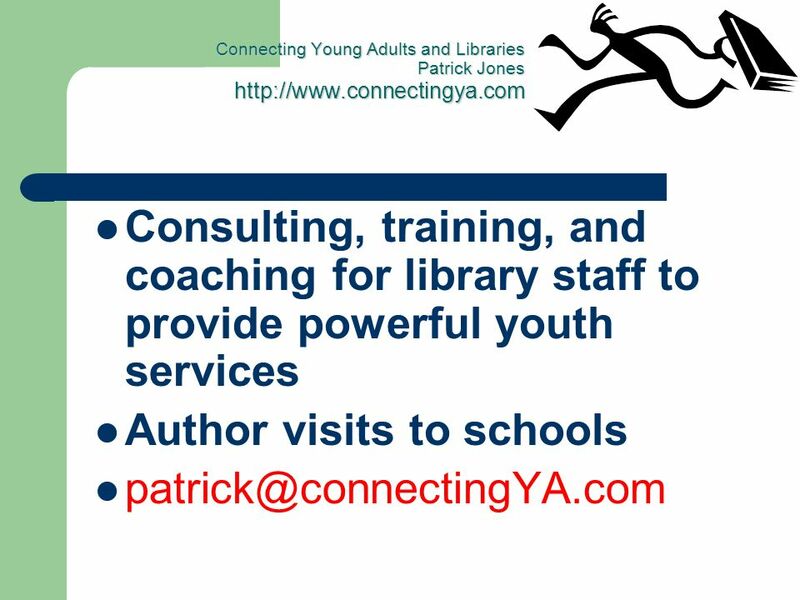 Don’t Tell, Sell: The importance of booktalking Patrick Jones Connecting Young Adults and Libraries. 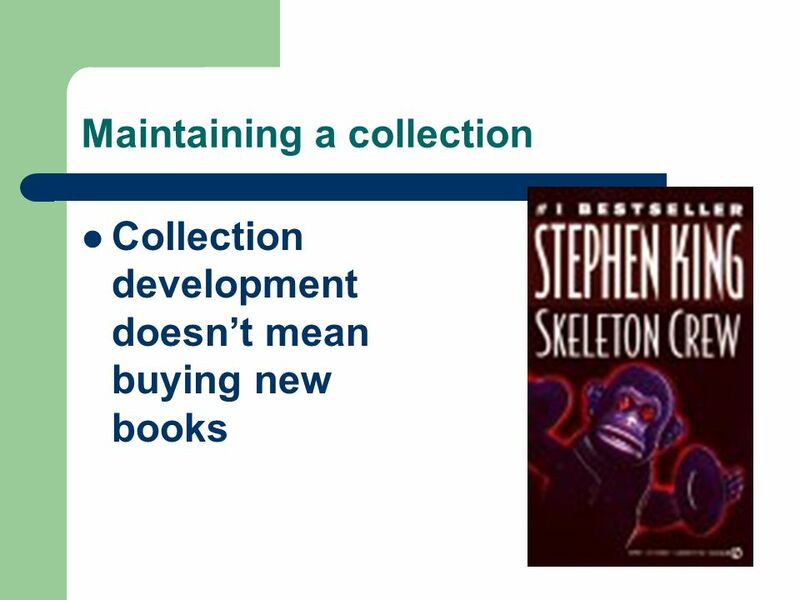 Maintaining a core collection Monster by Walter Dean Myers Buy the Printz winners and the honor books. 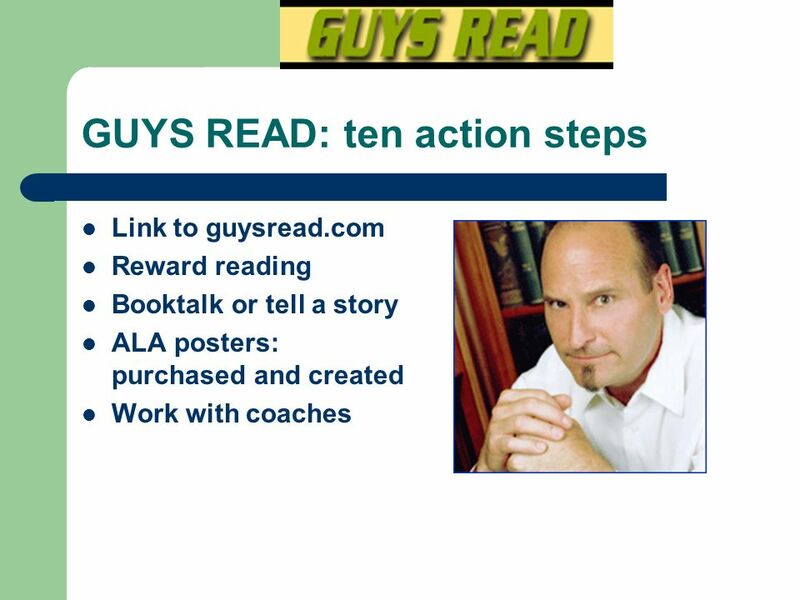 www.connectingya.com Small group exercise Have you now or have you ever been a reluctant reader? What is your reading autobiography?